Climate change is on its way to “halt and reverse” progress made in human health over the last century. The depletion of freshwater resources, the unprecedented biodiversity loss, ocean acidification, overfishing, pollution, deforestation and the spread of invasive species, that are related to climate change, but are environmental problems on their own, all compound these public health threats he said. Large areas of permafrost around the world warmed significantly over the past decade, intensifying concerns about accelerated releases of heat-trapping methane and carbon dioxide as microbes decompose the thawing organic soils. One quarter of the Northern Hemisphere and 17 percent of the Earth’s exposed land surface is underlain by permafrost. Most of these regions have been permanently frozen since the last Ice Age, 10,000 years ago. 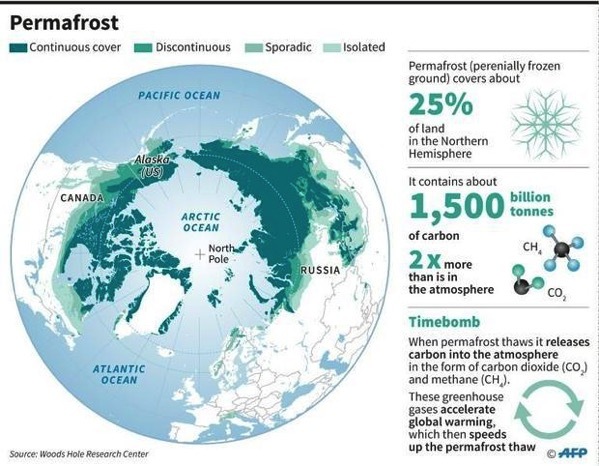 The permafrost, especially in the Arctic, can be 1.6 kilometers (1.0 mile) deep, trapping large amounts of carbon in the frozen organic matter. Global warming – particularly in the Arctic regions – has increased the potential for thawing of the permafrost and the release of carbon dioxide and methane gasses. The study was published in the journal Nature Communications on January 16, 2018. Using detailed data from the GTN-P, researchers found that on average, permafrost regions around the world—in the Arctic, Antarctic and the high mountains—warmed by a half degree Fahrenheit between 2007 and 2016. The most dramatic warming was seen in the Siberian Arctic, where temperatures in the deep permafrost increased by 1.6 degrees Fahrenheit. “There, in regions with more than 90 percent permafrost content, the soil temperature rose by an average of 0.30 degrees Celsius within ten years. In Arctic regions with less than 90 percent permafrost, the frozen ground only warmed by 0.2 degrees Celsius on average. Besides the most obvious impact – the release of vast amounts of carbon dioxide and methane – there are other concerns to take into account, especially for four million people living in Arctic permafrost areas. We have already seen the damages that thawing permafrost leaves behind. The buckling ground, holes, destabilized roads and bridges and buildings and homes shifting on their foundations. We can add ecosystems to the economic and infrastructure issues. 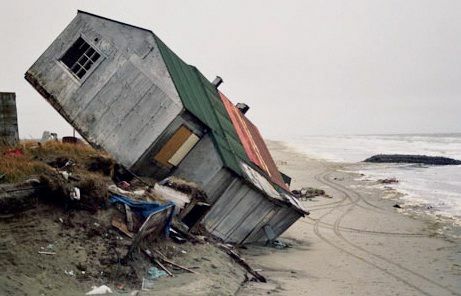 Massive discharges of silt and sediments have been dumped into our rivers and coastal areas due to the melting permafrost, forcing families to move away in some communities.